EtherCAT Technology Group. EtherCAT is the dominant technology in the fieldbus domain, and Ethernet is the standard for wired office applications using switching technology. TSN is the enabler for real‐time communication in a heterogeneous environment. In some cases, a combination of these two technologies is required. A better understanding of TSN and the streaming concept is a precondition for a successful implementation at the factory floor. The adoption of EtherCAT in this environment can be done very efficiently, with an upgrade at the master side and no changes to the slaves, and a moderate extension in the bridges connecting EtherCAT segments. 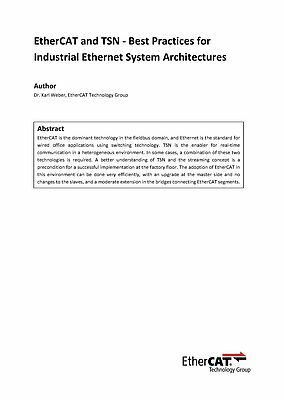 This whitepaper explains how to use this up‐and‐coming technology in the context of industrial automation.